LOS ANGELES, Aug. 10, 2018 /Christian Newswire/ -- Richard Rossi, a maverick minister-turned-moviemaker, has been cleared of a 1994 attempted murder charge of the assault of his wife. His vindication came from DNA, witnesses, and confessions of culprits who attacked and framed him. It was a sensationalistic case that was front-page news in his hometown of Pittsburgh, and was widely covered by tabloid TV shows. One of the confessions was from an officer Rossi exposed on his talk-show. Rossi outed police for assaulting women pulled over for traffic stops. The officer committed suicide in Ireland at an Antrim PSNI station, but left a note saying Rossi was innocent and that he and accomplices procured a man who looked like Rossi to carjack them. The second accomplice who confessed is in a hospital for the criminally-disturbed in Massachusetts. Rossi's current career as filmmaker who directed biopics on Roberto Clemente and evangelist Aimee McPherson, was birthed from the ashes of the scandal. Both Rossi and his wife Sherrie maintained his innocence. 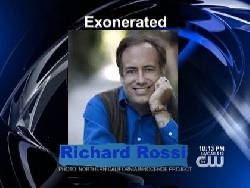 Mrs. Rossi testified that her husband was innocent in his trial, penned a book defending him, and filed a lawsuit for the wrongful prosecution of her husband. The publicity caused the Rossi's to move to Sherrie's hometown of Hollywood where Rossi reinvented himself as an artist who directed movies, released albums, and wrote a novel. The Rossi's started Eternal Grace, a ministry that focuses on "meeting the real needs of people with grace." "My brother's been like the Steelers coming back in the second-half," Rossi's brother Joseph said. "We thought he was finished. Before it happened they said if he didn't shut up they could frame and destroy him." "Richard was ahead of his time in confronting sexual predators and paid a price," Amy Thomson, a MeToo activist said. "He named names before it was fashionable and had courage to keep speaking out." "We forgive those who hurt us," Rossi said. "Despite being acquitted, articles quoted relatives of Rossi who didn't exist making him look guilty," Al Hill, a volunteer with a group focused on media accuracy said. "The cloud remained because of biased coverage." "Jesus forgave those who crucified Him. praying, 'Forgive them,'" Sherrie Rossi said. "We forgive those who tried to crucify us. Our faith and family are strong." Rossi's film 'Canaan Land,' is set for a 2019 release. Their daughter Karis, a graduate theology student at Princeton, is assisting with their ministry.